Organized by Karama, in cooperation with the Swedish International Development Cooperation (SIDA), HIVOS, and the Freedom from Fear Alliance, the seminar convened female and male activists to debate priorities and build alliances. Together, activists and partners from the region developed national and regional action plans focused on the themes of political participation, human rights, civil society and legal/constitutional reform. These interactions produced a consensus among Karama’s Yemeni partners on the need to bring a group of Yemeni women’s and youth activists to Cairo for a working seminar to chart a shared agenda for civil society in post-Saleh Yemen. 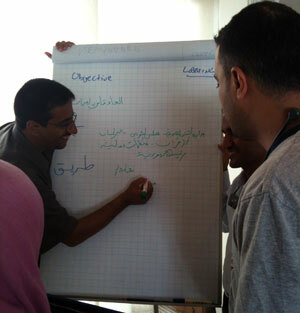 Subsequently, a seminar was held in 2012 in Cairo convening Yemeni women and men leaders and activists to establish priorities for future activism. The final goals included: a thirty percent quota for women in the national assembly; clear constitutional guarantees to life, liberty, and property; assembly, and protection of ethnic minorities; and a mandate for the strong enforcement of human rights legislation including CEDAW and the CRC.